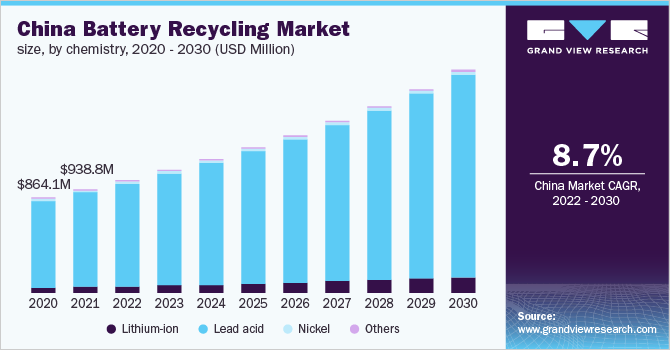 Battery Recycling Market To Witness High Growth Due To Increasing Demand From Transportation Industries By 2025: Grand View Research, Inc. The global battery recycling market is expected to reach USD 21.04 billion by 2025, growing at a CAGR of 10.4%, according to a report by Grand View Research, Inc.The presence of stringent government regulations is expected to have a positive impact on the market growth over the next eight years. Based on a report published by Grand View Research, Inc.; the global battery recycling market is projected to reach around USD 21.04 billion by 2025. Strict regulatory framework set by different governments and growing demand from various end-use industries such as consumer electronics, transportation, and industrial applications are anticipated to drive the market. Rising demand from emerging economies is also expected to bode well for market expansion over the forecast period (2018 to 2025). The projected demand from end-use industries is higher than the available resources for the production of new batteries. Battery recycling is necessary to recover valuable materials and to manage waste. The process is vital to avoid harmful environmental impacts. Utilization of these recovered metals can help reduce CO2 emissions. They can also reduce energy consumption during mining. All these factors are projected to propel the global market over the forecast period. High adoption of batteries in portable devices and Electric Vehicles (EVs) is also anticipated to positively drive the market. However, cost-driven nature of the industry is likely to restrict the market growth. The worldwide battery recycling market is segmented on the basis of chemistry, application, and region. Based on chemistry, the market is categorized into lithium-ion (Li-ion), lead acid, nickel, and others. The lead acid segment led with 61.2% market share in 2016. Advantages such as reliability, efficiency, and wide scope of application is anticipated to propel the demand. Around 95.0% lead from these batteries can be recycled, which makes them one of the highly recyclable batteries. On other hand, the lithium-ion-battery segment is projected to exhibit a CAGR of 11.3% from 2017 to 2025. Increasing demand for electric vehicles is anticipated to bode well for segment growth in near future. These batteries are extensively used in energy storage devices as well due to their efficiency and low maintenance. Furthermore, growing demand for rechargeable products in automotive sector is anticipated to boost the market during the forecast period. As per application, the market is fragmented into transportation, consumer electronics, and industrial. The transportation segment held around 41.7% market share in 2016. Factors such as high demand vehicles due to rapid urbanization and rising disposable income is expected to drive the demand in the forthcoming years. In addition, supportive government policies to encourage the use of EVs is also likely to boost the segment growth. The industrial segment is projected to exhibit a CAGR of 10.4% by 2025. Geographically, the market for battery recycling is divided into North America, Europe, Asia Pacific, Central and South America, and Middle East and Africa. Europe held the largest market share of 36.8% in 2016. According to the European Union (EU) legislation, about 50.0%, 65.0%, and 75.0% weight of batteries must be recovered as a part of the recycling efficiency targets. This factor is anticipated to accelerate the battery recycling activity in the region. Europe is anticipated to display a CAGR of 9.8% through to 2025. In North America, the recycling rate of used lead acid batteries is around 100.0%. In U.S., about 99.0% of lead is recovered from used products. Stern regulations and growth in battery recycling activities are projected to drive the regional growth. Moreover, increasing demand for UPS systems from commercial infrastructure is expected to boost regional demand. Presence of key players and increasing demand for electrical vehicle is also expected to fuel the market growth during the forecast period. Asia Pacific is projected to expand at a CAGR of 11.7% during the forecast period. This growth can be attributed to rapid expansion of consumer electronics and automotive among other end-use industries. Countries such as Japan, China, and India are anticipated to showcase healthy CAGR owing to high demand from automotive sector. The Central and South America region is projected to register sizable growth due growing foreign investments in the region. 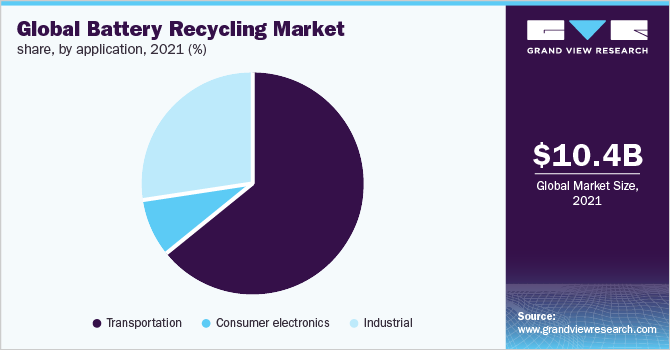 Key companies operating in the battery recycling market include Battery Solutions, Inc.; Retriev Technologies, Inc.; Gravita India Limited; COM2 Recycling Solutions, and Gravita India Limited.